30 years ago there was 3D CAD for part modeling. 20 years ago there was digital mock up for assembly modeling. 10 years ago we had PLM for managing the lifecycle of product. In 2010 Dassault Systemes is introducing lifelike experience. This is how Dassault Systemes put it as they explained “lifelike experience”, the theme of the 4th DS India PLM Summit which I attended today at the Grand Hyatt in Mumbai. Ajay Verma, Dassault Systemes VP of Value Selling, kicked off the conference by speaking about using lifelike experience as the new way of interacting with the world around us. The first technical presentation was given by Praveen Mysore, Senior Technical Manager at Dassault Systemes India. The presentation was titled “Create, Share and Build“. He started out by talking about the various “pains” involved in the product development process and how they could be eased by locating the data linked to a project centrally, accessible to everyone who needed it in real time. This leads to informed decision making due to the single source of information which is offered by the online V6 platform. Here is a video I recorded showing a number of DS technologies in action. Take note of how Live Buildings created a 3D model of a building quickly from a 2D drawing. Next Abhinav Choudhary, Dassault Systemes Head of ENOVIA for South Asia, spoke about enabling sustainable product development using V6 platform. Truth be told, I find any presentation related to the word “sustainable” rather boring. I hope I am the exception and not the rule, because we are really doing everything we can to screw our planet and we need to take this sustainability thing much more seriously, and that includes me. 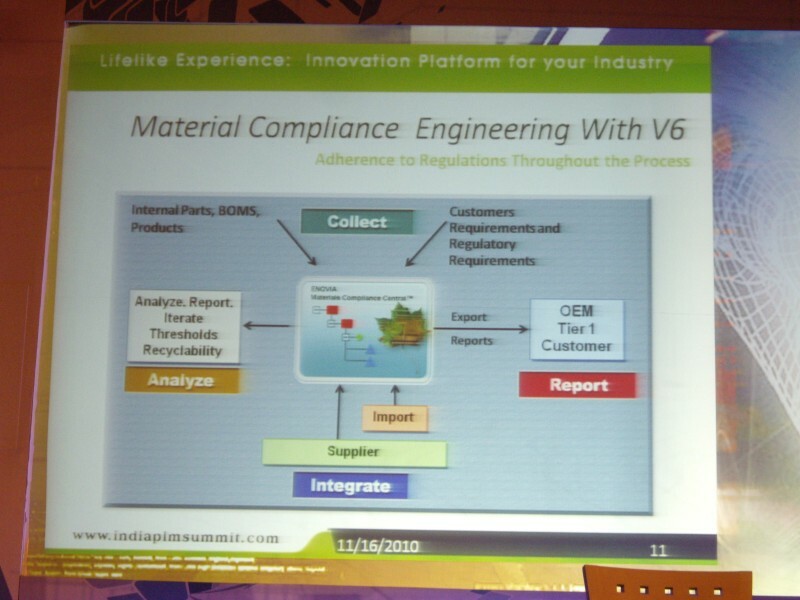 This slide shows how ENOVIA V6 can help achieve material compliance engineering. Anand Narayan from IBM spoke about “Smarter Systems and Solutions for Innovation“. He started out by mentioning some large numbers showing how we use, or rather waste, our resources. Apparently we waste 170 billion kilowatt-hours every year by simply not using power properly. As an example he mentioned leaving the TV on standby mode all night. In the US alone, 2.3 billion gallons of gas are wasted due to congested roadways. The presentation was about how technology could help solve some of these problems. He mentioned a conversation he had with the CEO of an auto manufacturer in which the CEO told him that his vision was to be able to do maintenance of an automobile by plugging it into a computer port. He envisioned that would be made possible by the increasing amount of electronics that is being put inside automobiles. Personally, I found the presentation rather vague and low on specifics. Next up was Xavier Fouger, Director of Dassault Systemes Global Learning and PLM Academy. The title of his presentation was “Towards Inclusive Growth“. He compared China and India in terms on their manpower in the fields of Science and Technology. He noted that while China had more technical and scientific people, the density of these people was much greater in India. I must admit, I wasn’t paying much attention to the presentation because by this time we were four hours into the morning session without a break. Sorry, there is only so much that my brain can take. Ironically, Xavier was talking about using lifelike experiences to provide high quality learning environments. IMHO, sometimes a simple coffee does the trick just fine. I looked at the agenda and noticed that the were two more presentations after this one. I walked out.